I am not going to get into the specifics of gear oil, since that topic could take up a whole post ! If you’d like to do research on what other types of oil to use, be my guest ! I suggest that you learn as much as you can before jumping into somthing. I suggest Red Line’s MT90. 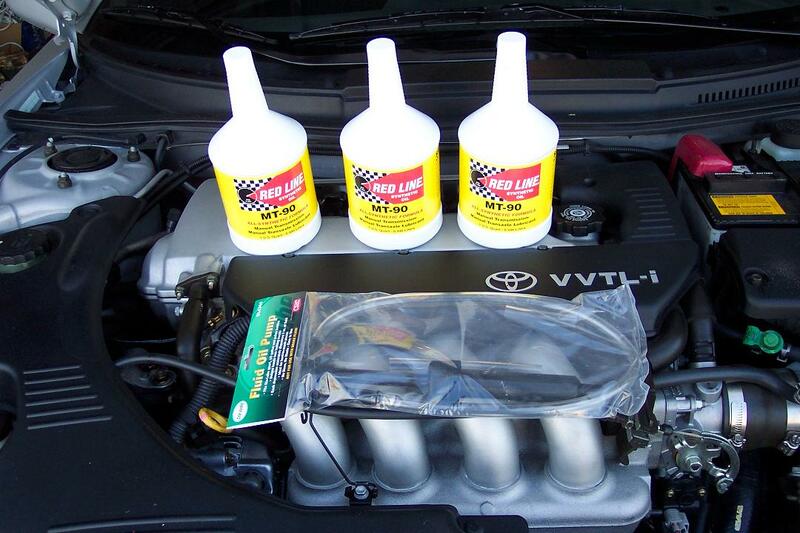 It has the specified weight and viscosity that Toyota says to use. I will, however, tell you to stay way from GL-5 gear oils, as they will deteriorate your syncros ! Lets start out with the first step, shall we ? Step One: Warm up the transmission and Remove driver’s side under engine plastic. Tools used: 10mm ratchet, flat head screwdriver, jack ,jackstands and wheel chocks. As the title says, warm up the transmission and engine slightly. The reason is to make the oil less thick and easier to drain. Just drive it around the block and head back to your garage. Don’t get your engine too hot, or you will have to wait for it to cool before you work on it. Remove the driver’s side under engine plastic. It’s really simple.. no need to explain this because if you cannot remove your spash guard you shouldn’t be under your car in the first place. You should be on a *level* surface, jack up the front of the car and provide jack stands at the front to give you a little bit more room to manage yourself (Dont forget those chocks) ! All of the bolts that hold on the splash guard are 10mm, and the clips need to be managed with that flat head screwdriver. Once it is out you should have somthing that looks like picture #1 ! If it dosen’t… then you have a problem. This step is to get you aquainted with the transmission and the locations of the fill and drain plugs. As you can see in picture 2 I have made sure you cannot miss them ! It’s pretty self explanatory… on to step 3! Once you know what bolt’s to remove to accomplish the task, lets get dirty ! 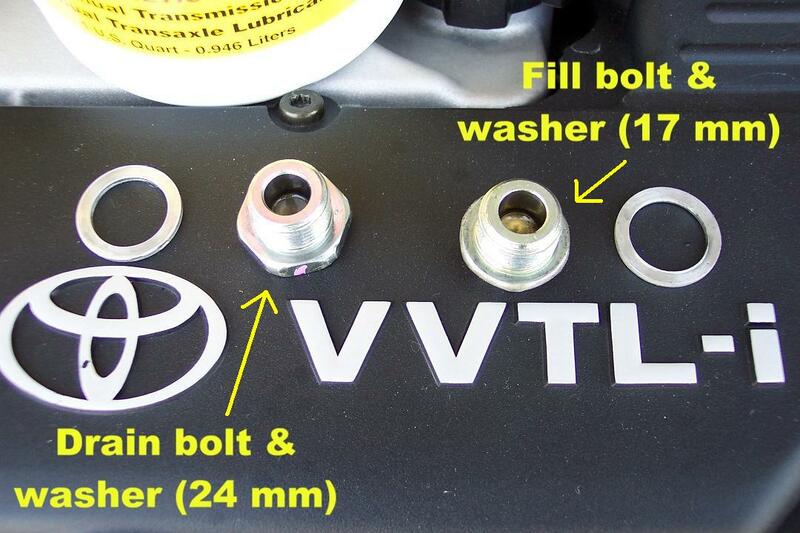 First remove the top fill plug – which is the 17 mm bolt. 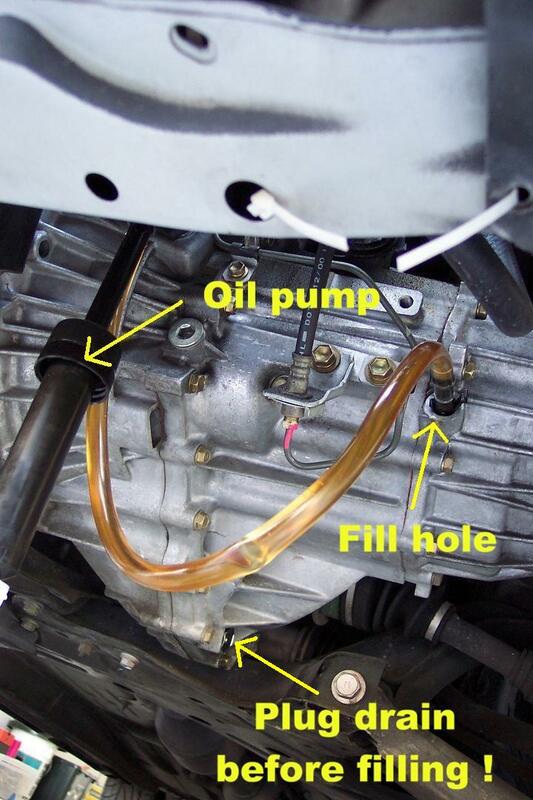 This is to allow air to fill the space of the old oil while it is draining. After it is removed place it and the washer aside in a safe clean place, you’ll need it again. 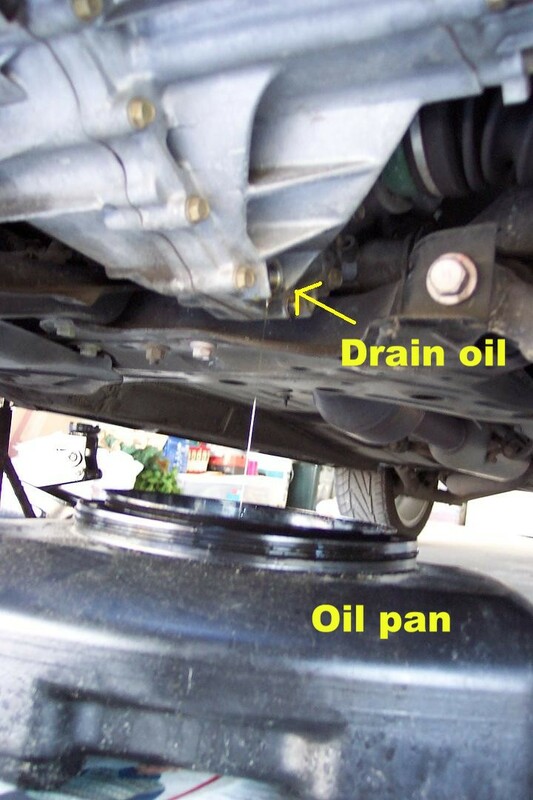 Place your oil pan under your drain plug. After you break loose the drain plug (24 mm) you should unscrew it by hand.. you don’t want this nasty oil on your tools ! S L O W L Y unscrew the bolt and then remove it.. oil will pour out of the drain VERY quickly, so be prepared. This is why you have your oil pan.. to catch it ! Be carefull, because it will be warm/hot. Place the drain plug and washer aside with your other plug. Let it drain for a while untill all the old oil is out (picture 3). Now isn’t that the most foul smelling stuff you can ever imagine ? Not to mention it looks like thick cola.. lol. Once all of the oil is out you should clean up your mess (yes I know you made one !) and move on to step four. Step Four: Fill the transmission ! Tools Used: Oil pump, new transmission oil, 24 & 17 mm ratchet. Now that you have drained all that nasty smelling oil and cleaned up, it’s time to fill it back up ! I have found that one of these $5.00 manual oil pumps works best, I purchased it from Advanced Auto Parts, so Im sure any auto store will have one (see picture 4). You will need 2.4 quarts of oil.. so purchase 3 quarts and you’ll be fine (incase you spill some). 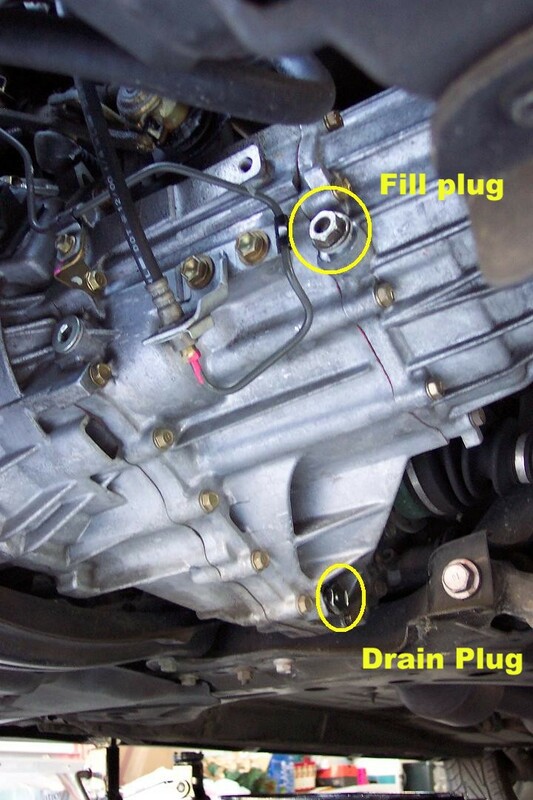 Picture 5 is the fill plug and the drain plug, along with their respective washers. Be sure to wipe them clean before re-installing them. Now remember the 24 mm bolt ? Back in the drain hole it goes ! Don’t forget the washer too. Tighten it up (not too tight ! This is aluminum !) Remove the jack stands so your car is once level again and then get out your oil pump and prepare to fill it back up (see picture 6). Start pumping untill your sure all 2.4 quarts are inside – a sure sign that your transmission is full is when it starts to leak out. After it is full, screw in the fill plug (17 mm) and tighten it down.. again, this is aluminim folks.. do NOT over tighten ! once you have the fill plug back in, your transmission should look like picture 2. Step Five: Putting it all back together! After completing step four, it is time to put it all back together ! Jack up your car and place your wheel chocks under the back wheels and jack stands underneath the front once again to give yourself more room to work. 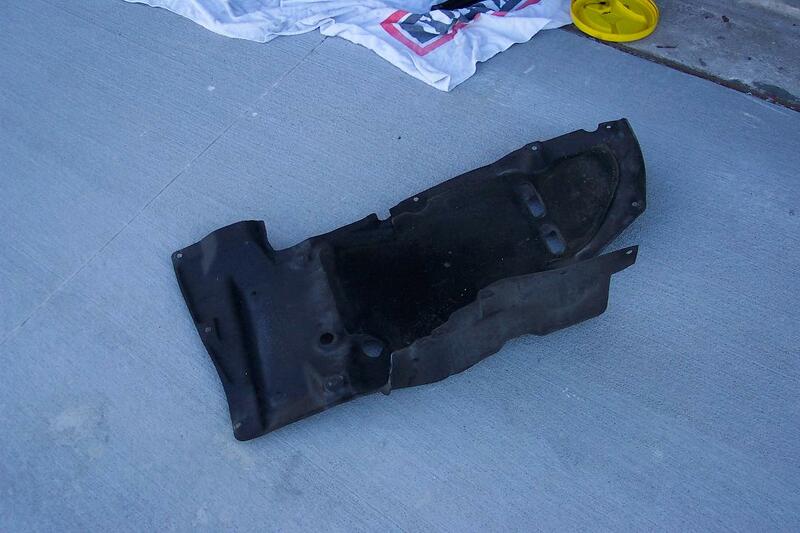 Clean off the excess oil residue left behind from draining and filling and proceed to reverse engineer the plastic spash guard to place it back on the underside of your car. Once you are sure that you have completed all of the steps correctly, remove the jack stands and lower your car back down and take it out for a spin ! Let the engine and transmission warm up before you begin to shift like a mad-man ! Notice anything.. ? It is much smoother and dosen’t whine ! Also, try lubing up your shift linkage with some white lithium grease for extended pleasure (smoother shift). If you have any questions or comments, please post them and I will answer them as soon as I get around to it.. good luck!